Last night not only saw the Boston Celtics unable to maintain a lead in the second half of game 7 against the Heat, but something else happened that has already had boxing and sports fans talking. I’m at a lost for words as I sit here writing about it. 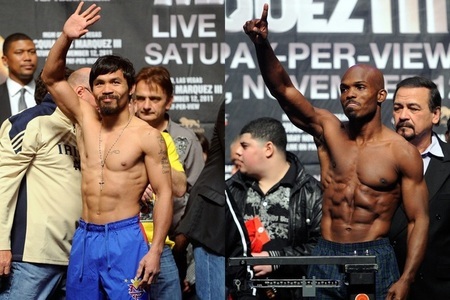 Timothy Bradley defeated Manny Pacquaio last night in what was a shocking upset who many still can not even fathom how. Though Manny did not really hurt Bradley, he was the much busier fighter and landed more power shots and punches in general. Though there was a slim chance that we would have saw Mayweather lace up the gloves against Pacquaio at some point in the future, you can bet your bottom dollar that the fight of the century will never ever happen for sure. Bradley won in a split decision and I’m perplexed understanding how he even won more than three rounds on a judge’s scorecard. I predicted Bradley to win since it made sense for the future of boxing but I was expecting a closer fight in my eyes. This prediction made it seem like boxing would share something with professional wrestling and that’s the idea of putting a guy over so he too can become a prize fighter, a big star. Why have one star in the sport when you can create another. Some say that this was Bob Arum’s doing, some say Pacquaio was punished for delaying the fight. This may have put a grey cloud over the sport, but it may create more business while Floyd Mayweather Jr remains inactive due to his current incarceration. It looks like a rematch between Bradley and Pac Man was already set in stone for November 10th before the fight even began. Manny Pacquiao and Timothy Bradley did not begin the fight until after the Eastern Conference Finals was over for what was seen as a good PR move. Manny, who was cheering the Celtics in his locker room ultimately suffered the same fate via the judges. This entry was posted in Media, Sports and tagged Blended Entertainment, Bob Arum, Boston Celtics, Boxing, Entertainment, Floyd Mayweather, Manny Pacquaio, Sports, Timothy Bradley. Bookmark the permalink.